Meet your neighbor Carole E. Kerfoot. Carole now resides in Augusta, but was born in Portsmouth, England. Carole came to the US when she was only 2 years old with her parents Edwin and Marjorie Meyers. Her father Edwin passed away in 2007. 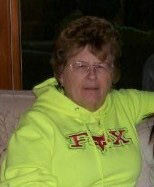 She grew up living in Ft. Green with her sister, Janet Allen, who now lives in Burlington, Iowa. She graduated from La Harpe High in 1962. Carole has two sons, Roger, who lives in RR Tennessee and works for Hometown Insurance Center of La Harpe and Rodney Kerfoot. Carole has 3 grandchildren Calvin and AJ who attend West Prairie Elementary and Ashley who attends Illini West High School. Carole worked for Methode electronics for 32 years and retired from there in 2008. She enjoys spending time with her grandkids and family. She also loves watching Ashley play softball and the boys playing summer ball. Carole loves to be outdoors and tending to her garden and flowers and just enjoying all of God's work.